Out of the blue one day, our dog refused to walk down the stairs in our home — the ones that connect the first floor to the second floor. He had no problem going up the steps, but he wouldn’t come down unless one of us walked side-by-side with him down each of the steps. He also had no trouble going down similar steps on our deck outside. The stairs in our house are solid wood, not carpeted. And we didn’t have stair runners at the time. This unusual behavior started about a year after we moved into this house. Before this, he had been going up and down those steps — without incident — several times each day. Maybe the lighting is bad on the stairway. Perhaps it’s too bright (causing a reflection/glare on the uncarpeted steps) or too dark (but even with every light in the house on, he still refused to come down those stairs). 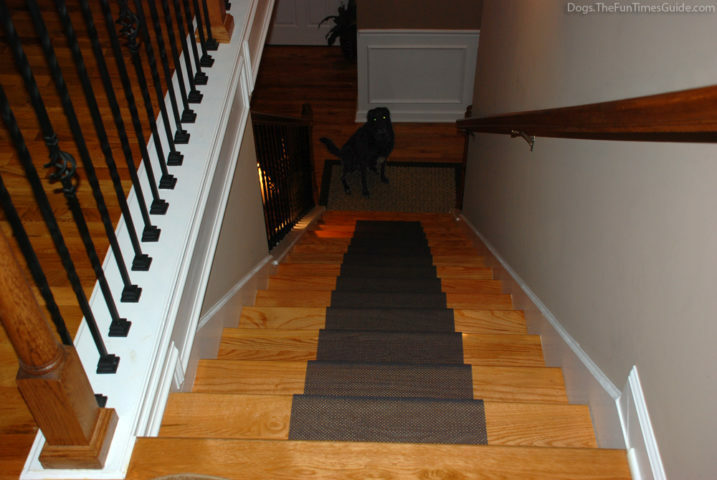 Fear of stairs — He had gone up and down these same stairs without incident for nearly a year before he just stopped cold in his tracks and refused to go down this set of stairs any longer. He didn’t fall down the stairs, didn’t get scared one time on the stairs, and didn’t have any other strange occurrences on the steps that we were aware of. Leg issues — He had TPLO surgery on his right rear knee 3 years earlier, but at our most recent vet appointment we were told there was nothing acting up with Tenor’s legs. I’m telling you, this had us completely baffled — especially the fact that it happened so suddenly. 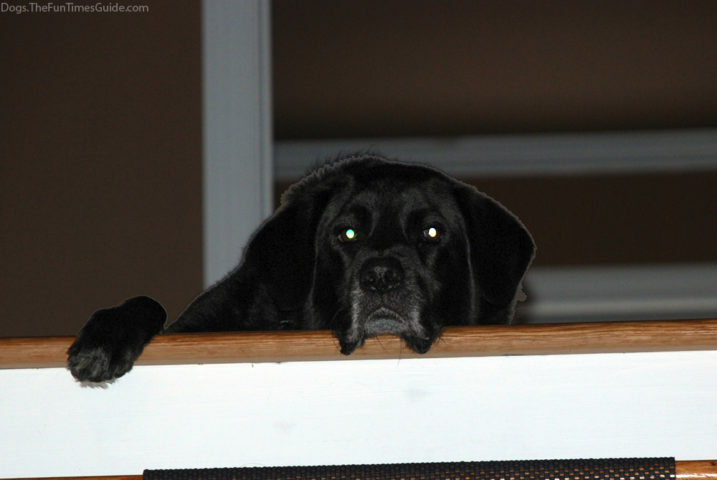 We went through a couple weeks of trying different things to figure out what suddenly caused Tenor to stop going down the stairs. I even called a General Contractor friend of ours (and fellow dog lover) to get his opinion on things to try. He said to look at the stair risers (the tall space between each step) and the sides of the stairs themselves. He thought, since those areas are painted white, that could be causing some extra reflection on the dog’s eyes. So, short of re-painting the stair risers at this point, I rigged up a home-experiment to make the stair risers and sides a dull brown color — rather than a glossy white color. Did Tenor come down the steps after that? For what it’s worth, Tenor has no problem walking over / through / under obstacles. So having these things placed on the stairs — in and of themselves — were not intimidating to him. This experiment made it clearer that the stair treads themselves were most likely the key problem here. In the end, nothing got Tenor to come down those steps except for ONE THING: brown padded shelf liner! I started with a leftover piece of thinly padded non-adhesive shelf liner (that’s supposed to be cut-to-size and placed in your cabinets and drawers). I always have some of this stuff on hand, but I’ve never used it as shelf liner. Instead, I use it to keep small throw rugs in place throughout the house. It gives them a bit of a “grip” without being “tacky”. I’ve also used it as a jar opener with grip! The piece I had was large enough to span across 2 steps (while hugging those 2 stair risers, as well), so I decided to see if Tenor would walk on that and come down the stairs on his own. Once he got past those top 2 shelf-lined steps, he just kept on going. Once he started going through the motion of walking down the steps, he just continued without pausing. 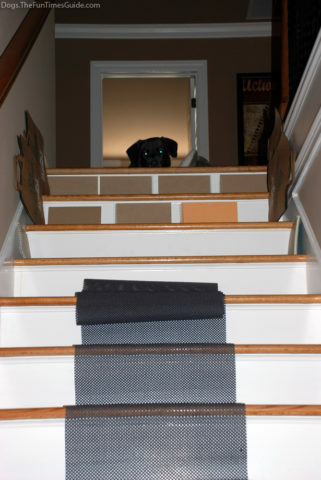 We attribute the success of this DIY stair runner to its color and texture. 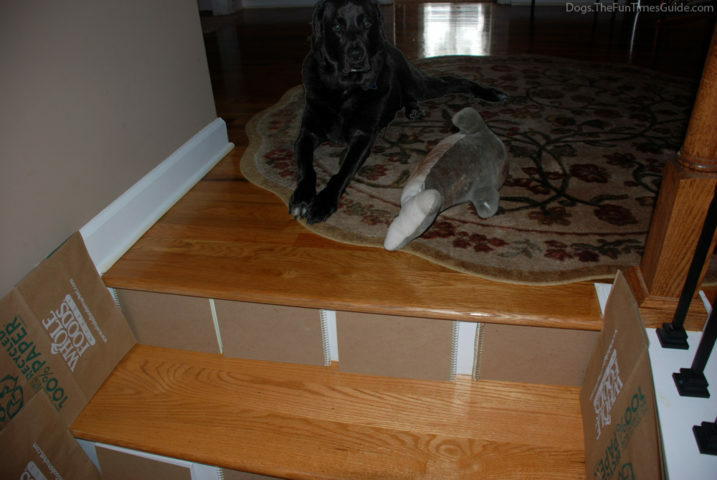 Something as simple as shelf liner on the stairs ultimately gives Tenor the confidence to trot down the stairs without thinking twice anymore. Personally, I think it’s just the slick surface that he didn’t trust himself on anymore. He must have slipped once that we didn’t know about or had some other scary experience that caused his behavior to change overnight. To continue this home experiment for a longer time (and before we invested in a more expensive “official” stair runner) I ended up buying 2 new 10-foot pieces of the chocolate brown colored shelf liner for $20 total. They almost perfectly reach from top to bottom of our stairs (including the risers) — just as a real stair runner would. Since the shelf liner is slightly “grippy” on its own, I didn’t tack it down or anything — it pretty much stayed in place. What About Longevity & Durability? Here it is almost a year later, and my original DIY stair runner is still in place. After a month or so, it was clear that this $20 solution had made Tenor’s life better (and our life as well — because we had resorted to closing off the stairs so Tenor could not be upstairs with us while we worked all day in our home offices). 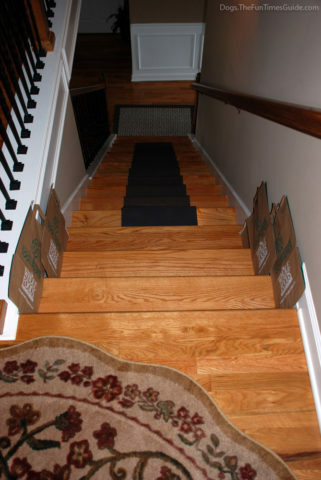 I know, you would think that just about any stair runner would look better than this makeshift one made of shelf liner! But a real stair runner (and the process required to install it) costs a fair amount of money and forever changes the look of natural stairs (which we prefer, over carpeting). So, we want to make sure we find exactly what we’re looking for before we go through all that. At first my husband cringed when he heard what I had done (one weekend when he was out of town). And I admit, it’s not a very classy thing to do. It certainly doesn’t fit in with the rest of our home decor. But to be honest, it doesn’t stand out like a sore thumb either! Very few of our visitors have even noticed it. Keep in mind, this was initially a just quick makeshift solution to worrisome dog problem — so really I didn’t care too much about how it “looked”. I do still consider this a temporary measure, not a permanent one. It’s just stuck around a little longer than I had initially thought it would. Now it’s 4 years later and I’ve replaced the shelf liner just once! It really is a great solution. What started as only a temporary solution has become a permanent solution in our home. And you know what? No one has ever commented on our funky stair runner. 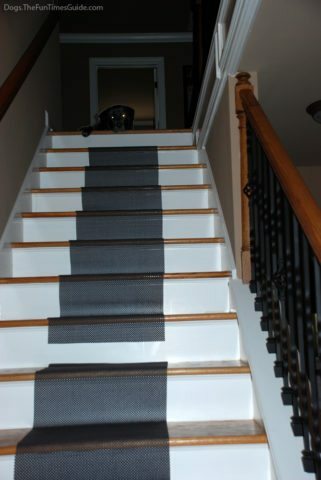 It may look a little bit narrower than most stair runners, but it doesn’t stand out like an eyesore. It actually blends in with our all-brown home decor quite well. By the way, shelf liner comes in other colors, lengths, and widths.